Have you ever been midway through a climb and wished you had an extra layer? Most of the time, there’s really not much you can do. 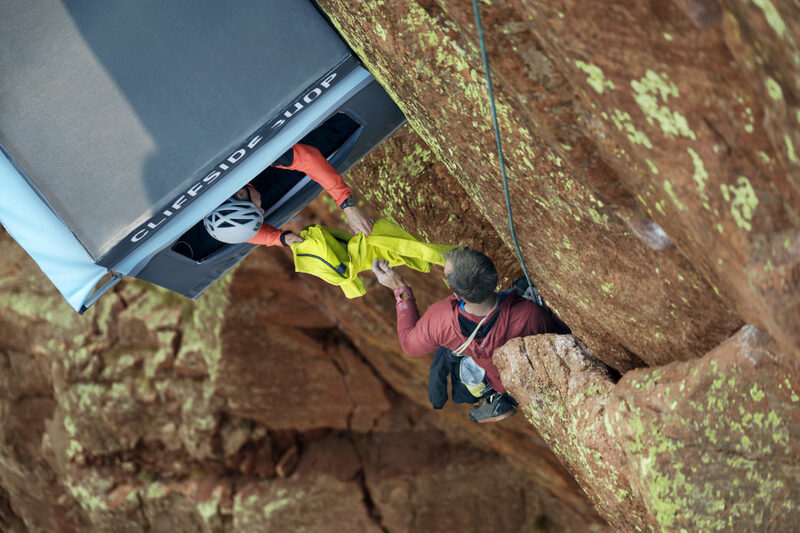 But for two days in August of 2017, 150 climbers on Eldorado Canyon State Park’s iconic Bastille formation were in luck—they just had to climb a bit farther up Outer Space (5.10b/c) to 37.5® Technology’s Cliffside Shop. 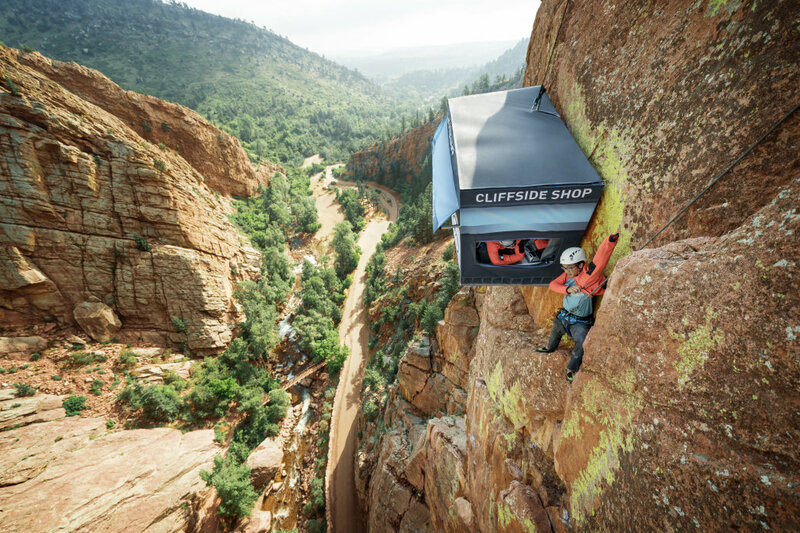 The Cliffside Shop was the world’s most remote pop-up shop, although that moniker doesn’t quite accurately portray the careful planning and rigging it took to set it up. The Bastille was an ideal location for the shop since it’s literally right next to the road that winds through the park. “It’s also really aesthetic,” noted Josh Gross, lead rigger for the project and a guide with the Colorado Mountain School. On the first morning of the pop-up shop’s tenure, a crew of climbers, riggers, and photographers showed up around 4:00 a.m. The idea was to have things set up and ready to go at sunrise, when the light is best for shooting. It took about a half an hour for riggers to set up the Black Diamond Cabana Double Portaledge—a hanging tent meant for sleeping cliffside on big walls like Yosemite’s El Capitan—on the ground at the base of the cliff. Meanwhile, the rest of Gross’ team hiked to the top of the formation via a Class 3 ramp. Once the portaledge had been assembled, the summit team lowered 350-foot ropes to the ground. These, along with ropes anchored to the ground, were attached to the structure. It took about a half hour for riggers to set up the Black Diamond Cabana Double Portaledge, but the whole project took about 2-3 hours to get up the wall. “The biggest thing with a portaledge like this,” Gross explained, “is that it needs to be windproof.” This was especially true on the Bastille formation, which is very exposed to the elements. The riggers hauled the shop (which weighed in at just under 20 pounds) up to its perch and began securing it to the wall. The team was able to use gear that had been already installed in the wall (by climbers) to keep the portaledge in place. 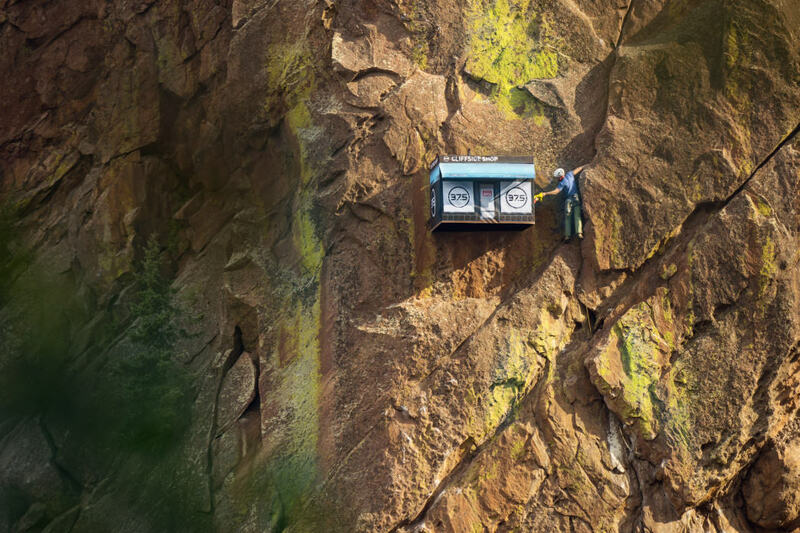 Local climbers at Eldorado Canyon State Park were in for a surprise. Once the shop was fixed in place, the team set up hanging shelves inside and lowered haul bags full of merchandise from the summit. This would be the shop’s inventory for the next two days. 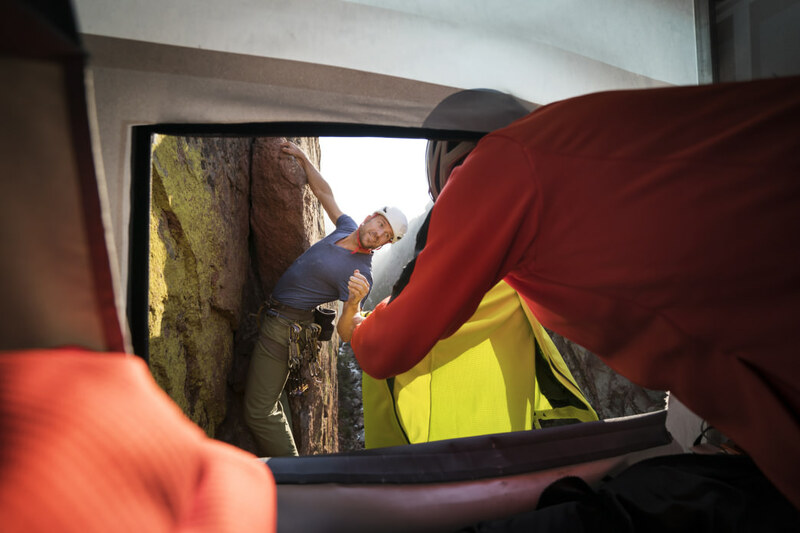 Dave Bywater, Vice President of Sales at 37.5 Technology, would man the shop and hand out 37.5 products to climbers as they passed the portaledge. Over the two days, every time someone climbed past the shop, $100 was added to a running tally of donations for three climbing advocacy organizations: the American Alpine Club, the Access Fund, and the Action Committee for Eldorado (ACE), the local climbing access group. In all, the Cliffside Shop’s presence raised $15,000, enabling them to donate $5,000 to each organization to replace old climbing anchors. “Everybody got a kick out of it. I mean, it’s funny to have a shop set up on the side of a cliff,” said Bywater. He spent part of each conversation explaining that the goal of the shop was to raise money to donate to access organizations, and climbers were thrilled to hear about the effort. “They know the anchors need to be replaced,” he noted. Climbers were also happy to accept the free gear. If you’re in need of a layer to keep you comfortable, apparel with 37.5 Technology is the way to go. This innovative technology, which is already being used by Rab, Point6, adidas, and several other big-name outdoor brands, works to keep the body’s core temperature at an optimum 37.5 degrees Celsius and its microclimate at 37.5 percent humidity. 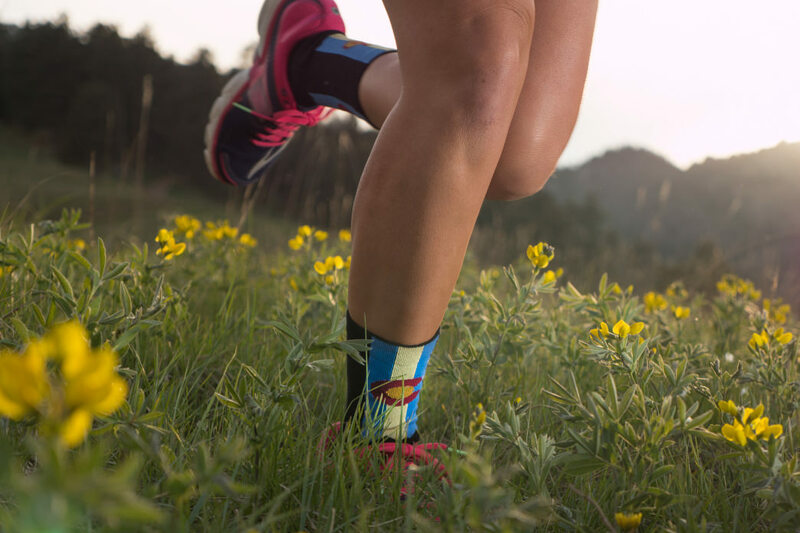 This is possible thanks to the embedding of microscopic volcanic sand and coconut fibers directly into the fabric and keeps your body performing better for longer periods of time. Most folks involved in rigging scenarios like the pop-up shop have extensive climbing backgrounds and mountain rescue training. Setting up the shop was a complex process with a lot of moving parts, but this team was well prepared for it. “Everyone was a longtime climber,” Gross explained, “so there was a vision of the whole thing right from the start.” This, he pointed out, made it easy to communicate with one another, since everyone involved was familiar with climbing language and systems. Most folks involved in rigging scenarios like the pop-up shop have not only extensive climbing backgrounds but also in-depth rescue training. Gross, for example, is an American Mountain Guides Association-certified guide and has worked as a climbing ranger at Rocky Mountain National Park, while other team members have worked on YOSAR, the search-and-rescue operation in Yosemite National Park. Setting up the shop was a complex process with a lot of moving parts, but resulted in $15,000 worth of donations to climbing organizations.